– Use two fingers to scroll until fingers are released. – Use three fingers to scroll fast until top/bottom. Phone wake up: Via home or power. Hold menu: Quick access Android search. Double click home: Quick access voice commands. Multiple home screens: Touch the dots to switch directly to a screen or hold and drag left/right to scroll very fast. Changing shortcuts at the bottom: Click „Applications“ (bottom right), then menu, click „Edit“: Now change the three (left) icons via drag & drop. Afterwards click menu and choose „Save..“. Quick brightness change: Hold the notification bar (on the top) and drag left/right to modify brightness (if not set to auto). Quick view current date: Hold the notification bar (on the top). Pinch home screen to view all home screens and add/delete them. Pinch application screen to view all application screens and reoder them. Set background image for lock screen: When changing your desktop background image, there are two buttons, choose the right one (smaller area) and save. Now you‘ll be asked to use this image for the lockscreen too. E-Mail: Pinch in the overview list to fold/unfold by date. E-Mail: Click longer on a date (either the sent date or a date in the email text): Create a new calendar event for this date. Contacts: Drag left over a contact to send SMS, drag right to call. Keypad: Use the letters on number keys to type a name, the triangle on the right shows how many matching contacts are found, clicking on it reveals them. Camera: Change shortcut buttons by clicking menu, “Edit”, then modify shortcut buttons via drag&drop. You can configure shortcuts for picture and video mode independently. Camera: Pinch to zoom in/out. Browser: Pinch to view all tabs/windows. Browser: Go to “about:useragent” via address bar. Now you can modify the user agent string. Video player: Drag left/right to Fast forward/Rewind. Video player: Power locks/unlocks the screen. Calendar: Pinch in month view to get an overview, swipe left/right to change the year. 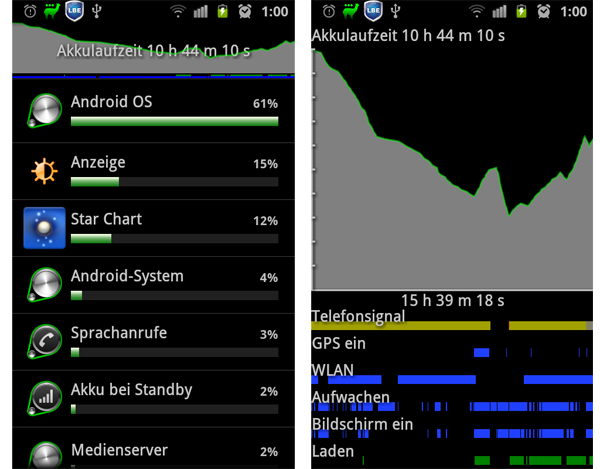 Settings: Open Settings/About Phone/Battery Use and click on the graph at the top to zoom and view more details in a timeline. If you get an error when trying to uninstall an app: Did you assign the app as “Device Admin”? If so, you have to remove this before uninstalling (Settings/Location and Security/Device Admin). Samsung offers a free service to track and control a lost or stolen mobile: Enable “Remote Access” in Settings/Location and Security. Then login at www.samsungdive.com (with your Samsung account data) to locate and remote control your phone. Turn phone off, press and hold: volume Up + home + power. Use volume keys to navigate up/down, home to execute. Menu: Settings > Privacy > Factory data reset. My S2 buttons at the bottom stopped working. Is this a software isssue, or hardware? Tried updating to new Android software through Kies, but still no buttons. T-Mobile is replacing my phone later this week, but I want to know why! My Samsung (of this model) has just developed a bug whereby the screen won’t turn off, ever. It started two days ago when the battery went completely flat. It is now charged, but loses power at an incredibly fast rate, because the screen is always on. The screen time-out is set to 30 seconds, but changing that setting does not fix it. Any ideas of what I can try to fix it would be greatly appreciated! Maybe an app runs crazy so try to uninstall some apps you recently updated/installed. I have question: how to get rid of unwanted “hub” apps? I set my s2 to factory settings and lost all my pics on picasa. I guess I had synced my picasa with the phone and have now lost all the pictures from picasa. Can you please let me know if I can bring back my old pics on picasa? Are they still online on picasa? ( https://picasaweb.google.com/home ) If so, you should make a backup by downloading them (always a good idea) and then enable Google Picasa sync on your phone. Yes, open “S Voice”, go to the settings in the context menu and uncheck “Open S Voice” (Might be named differently, I currently just have the German version). I found that also quite annoying and used either the list view there or a completely different tool to manage the apps. They aren’t stored on the accessible part of the SD card – I assume they are in the /data-folder which is not accessible from the PC/Mac (You can try with tools like ES Explorer but be careful because you might break stuff). can someone tell me how to change the text settings so the recipients text isnt on top and mine on bottom? its annoying to scroll up everytime to see what they are texting. it should be in order of my texts then the next text… etc..
You can try another app for SMS like Handcent or GoSMS which are both free. See comment below – is probably an app which misbehaves. This usually is caused by apps which are “always-on”. Try to uninstall apps you don’t need and check the preferences in “Accounts & Syncing”. I just purchased a samsung galaxy s2. I done the update for it but it didnt work, it froze so i took the battery out and put it back in then switched it on. Nothing comes up except for a blank screen and 3 icons, a phone, a orange triangle with an exclamation mark in the middle and a pc icon. i have tried reseting it but nothing happens, the icons go away then come back again, please, do you know how to fix this? Hi – sounds there have been problems while updating but the bootloader somehow still works. how to remove samsung account ? You can remove an account in the settings: Account and sync. There click on the account and you can delete it with a button at the bottom. My custom(downloaded) default ringtone keeps ringing silent when someone calls, but when I choose this custom ringtone in my settings>sound>phone ringtone>android system> the ringtone is there and when I tap on it, it plays correctly. Any suggestions? how do I access my launchers list? It’s labelled “menu” in the picture on top of this page. If this happens after restarting the phone it sounds like a mechanical failure. Either the home button is somehow pushed in always or another hardware problem. But usually you should also encounter other problems if the home button is always “on”, maybe time to take the phone back to the store..
Just use the left soft key and click “grid”. IUsually you should just get a call which you need to confirm – but how to confirm is dependent on the collect call method which varies by country and phone company. This is not specific to a special mobile handset. try it with an image in the gallery, some webpages can’t be zoomed for example. Any ideas in how to set a different screen for home default? When I press home button it goes to home screen #1, but I want to go to home screen #3 as default… any idea in how to configure it? I think with the standard Samsung Launcher (TwLauncher) you can’t choose your default home screen. You can reorder screens (pinch out and drag them) or use a different launcher, like Go Launcher Ex or ADW Launcher, these offer some more features.